A queen bee can lay up to 2,000 eggs a day. Beekeepers across the South West have been taking part in the Callington Honey Fair in Cornwall. Hundreds of people attended the annual event which takes place by ancient charter, with its roots going back to the 13th Century. Beekeepers have been preparing since the flow in July and August - the time when honey is taken from the hives. Despite keepers saying the poor weather has resulted in a disappointing year for honey, judges praised the standard. Judge Stephen Pearce says bees and honey show nature at its best. He said: "Looking at the bees and seeing what they do is amazing. "At the end of all the bees hard work you get the honey - and I love honey." 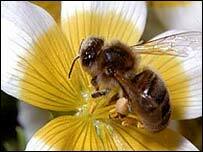 But beekeeper Mark Hoult says it has been a poor year. 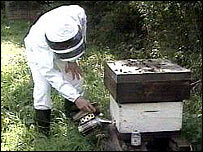 He said: "It's been the worst year I've had since I started keeping bees - and that's over 20 years ago. "I think it's been a combination of the weather and the flora not coming together at the same time. "When the flowers have been out, it's been too cold or wet for the bees to go out and collect the pollen." Most hives have about 60,000 bees who live for just six weeks, but a queen bee can lay up to 2,000 eggs a day. Among the attractions at the fair are honey sales and competitions, charity stalls, street entertainment, a funfair and the Callington Town Band performing in the town square.